This pattern stella features the same design as the 1879-dated issue, and traces its pedigree to Edward Maris and the Garrett Collection. Approximately a dozen examples are known in gold, along with a similar number of copper patterns, and just five or six in aluminum. Two of the aluminum examples were included as part of the King Farouk Collection sold in 1954, with their current location unknown. 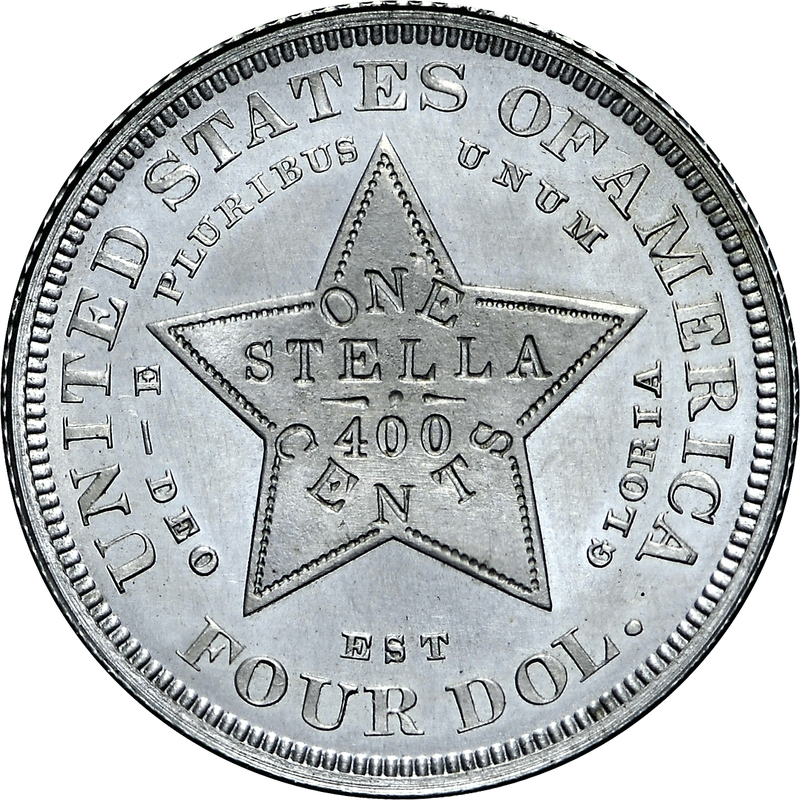 Patterns of 1880 follow the 1879 series of metric dollars and stellas with similar or identical designs. 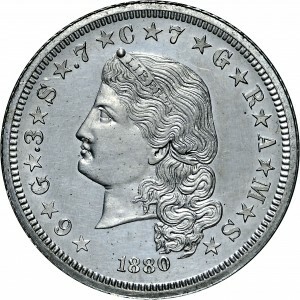 From Stack's sale of a portion of the John Work Garrett Collection, March 1976, Lot 668c. 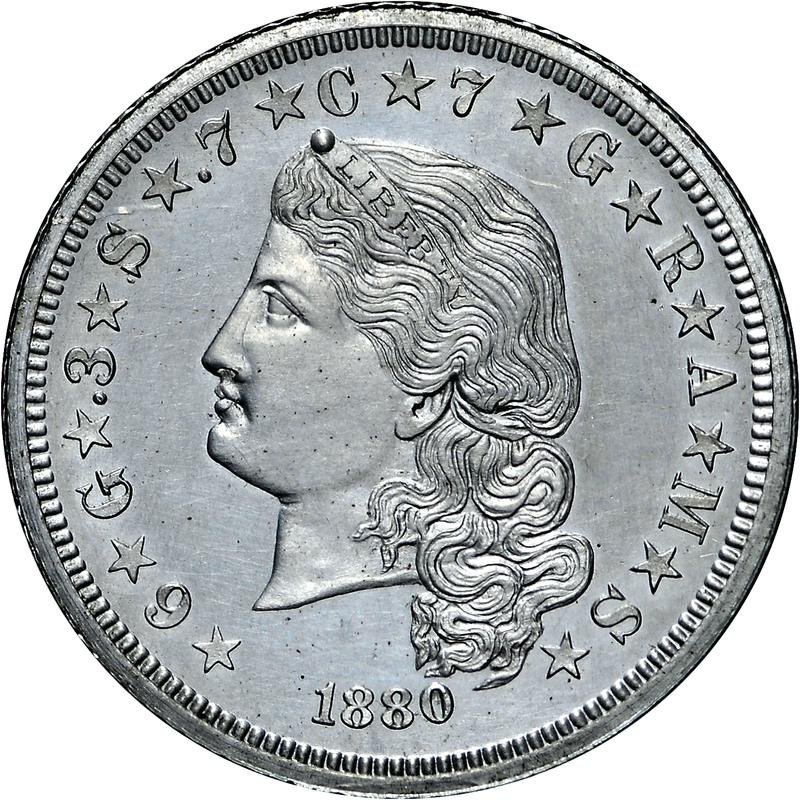 Head of Liberty to left with flowing hair behind, wearing coronet inscribed LIBERTY, legends around read *6*G*.3*S*.7*C*7*G*R*A*M*S* with date below. 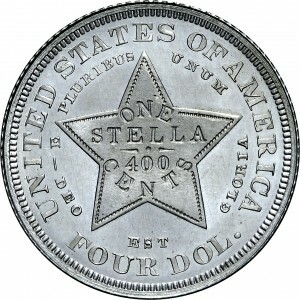 A five-pointed star at center inscribed ONE / STELLA / 400 / CENTS, two circular legends around, closest contains motto DEO EST GLORIA below and E PLURIBUS UNUM above, outer legend reads UNITED STATES OF AMERICA above and FOUR DOL. below.